BECAUSE it's plain and porky-looking, the Q3 really stands out in Audi's current catalogue. More recent models from the German brand - the Q7 SUV, A4 sedan, A5 coupe and TT sports car - are all attractive. And all of them are among the most capable cars in their classes. The seven-year old Q3 isn't. It has a too-small cargo bay, a not-roomy-enough rear seat, and isn't nearly as good to drive as its price tags promise. This will change in the middle of 2019. 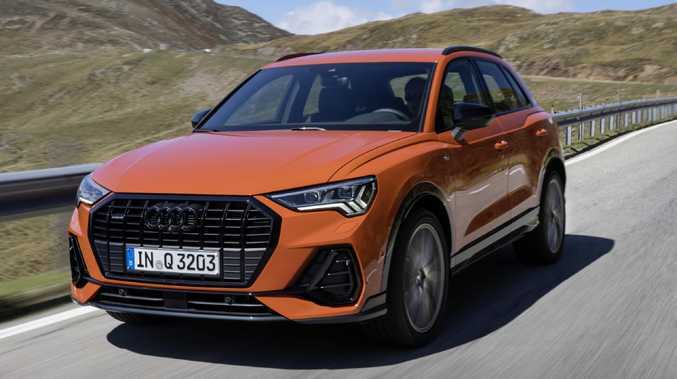 That's when the second generation Q3 goes on sale in Australia. 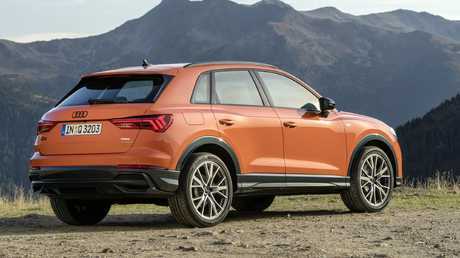 Audi has presented the new Q3 to international media in northern Italy, and it brings big improvements. The new-generation Q3 brings much needed improvements across the board. 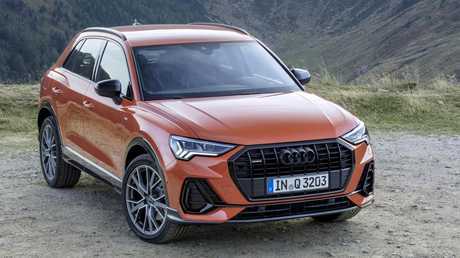 Audi has enlarged its small SUV, stretching its length by almost 100mm and adding nearly 20mm of width. The increase in rear-seat roominess is significant. Behind the rear seats' 40/20/40 split-folding backrest is a much larger luggage compartment with a clever floor height adjustment feature. But wait, there's more. The rear seat slides fore and aft, meaning the ratio of passenger space to cargo capacity can easily be altered. These measures make the new Q3 a much more useful and versatile vehicle than the car it will replace next year. Gone, too, are the dumpy, frumpy looks. The new model's sharply creased exterior panels add some flair to an overall shape that's better proportioned and more muscular looking. 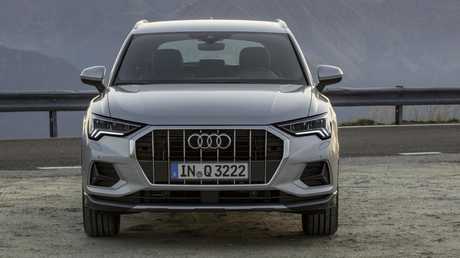 The new Q3 will look right at home among other models wearing the four-ring badge. Sharp creases and a more aggressive stance are the focus of the exterior facelift. If the outside is good, the interior design is even better. The layered and stepped dash design deliberately echoes the visual themes of the exterior. Its centrepiece is a lusciously high-res touch screen surrounded by an aluminium frame that mimics the style of the Q3's grille. For cost reasons, the glass touchscreen lacks the fingertip feedback that's a feature of Audi's top-end luxury models. Still, it adds a real touch of upmarket class to the new Q3. And because the Audi's on-screen menus can do so much, there are few physical buttons and switches to clutter the instrument panel's clean look. The screen and the centre console below it are angled 10 degrees towards the driver. This is a car that focuses on the driver in other ways, too. The wide range of adjustment offered by its comfortable and supportive seats means all sizes should be able to find a perfect driving position. The Q3's relatively slim windscreen pillars bring better-than-average forward vision. The new Q3 uses the same car-construction building blocks as many other models from the giant Volkswagen Group. Known inside the company as MQB, it's a set of components - suspension, steering, brakes, engines, transmissions and more - that has a reputation for providing a sound foundation for above-average cars. The Audi Q3 is built off the company’s versatile MQB platform. MQB does its thing again in the new Q3. The Audi's refinement is truly outstanding. This is a quiet and almost vibe-free vehicle. Its suspension is calm and capable, smoothing out bumps with impressive efficiency. And this SUV's handling isn't bad at all. The Q3's height rules out sports car handling, but this is a car that displays real talent when upping the pace. The sole disappointment is the Q3's feel-free steering. Its driver deserves a better sense of connection with its agile chassis. 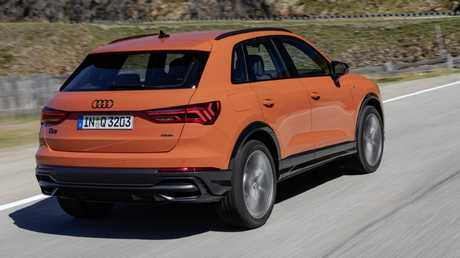 With the new Q3 comes a new engine for the least costly model that's most popular in Australia. The current front-drive 1.4 TFSI accounts for about 60 per cent of Q3 sales here. Its replacement will be badged 35 TFSI, and it will have a 1.5-litre turbocharged four-cylinder petrol-burner. Maximum power and torque figures remain unchanged at 110kW and 250Nm. A large infotainment screen is the centrepiece of the Audi’s grand interior. Though a little gravelly sounding at low and middling revs, it's a reasonably refined engine that delivers decent rather than outstanding performance. The Audi's seven-speed double-clutch auto, however, does an outstanding job of making the most of what the engine has to offer. It's very good at smoothly picking the right gear in nearly every situation. When the Q3 goes on sale in Europe around November there will be two other engines. The 45 TFSI quattro will have an upgraded 2.0-litre turbo four and the 35 TDI quattro will have an upgraded 2.0-litre turbo diesel four. Both will feature all-wheel-drive. Expect this pair, along with the 35 TFSI, to be included in the Australian line-up. According to Audi Australia, prices are unlikely to rise much compared to the current Q3. This means the 35 TFSI should cost about $45,000. Unlike the current 1.4 TFSI, it has the looks, quality, technology, space, versatility and sheer usefulness to justify its premium price. The price for the new Q3 is expected to remain about $45,000. Why has Audi introduced new designations, with seemingly random numbers replacing references to engine capacity? For example, 1.4 TFSI becomes 35 TFSI. The answer is electrification. Battery electric vehicles and hybrids completely or partially cut the link between engine size and performance. Audi has both in its future and wants names that make the hierarchy clear without reference to engine size.